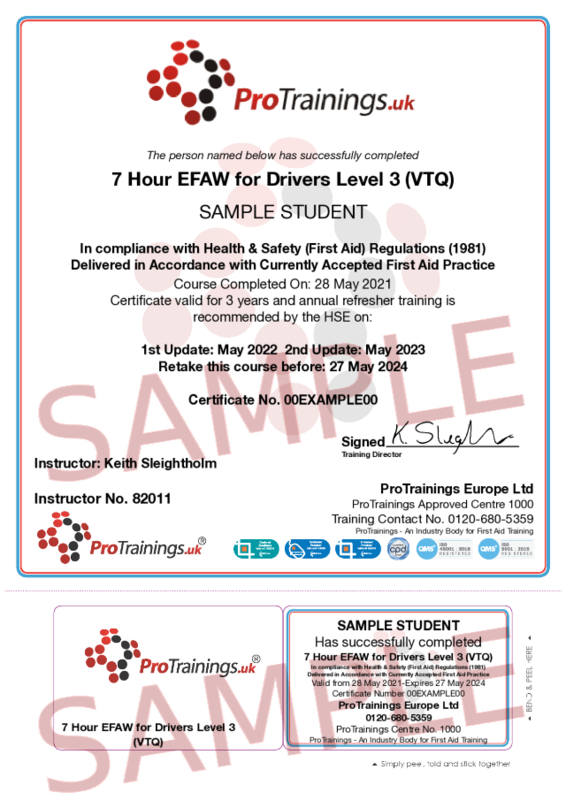 The Emergency First Aid at Work for Drivers Level 3 (VTQ) course (EFAW) is designed as a ProTrainings CPD certified qualification, all courses are delivered, evaluated and quality assured to meet the new guidelines set out by the HSE in October 2017 and meet the requirements of the First Aid at Work (First Aid) regulations 1981 and subsequent 2017 changes. All our first aid courses fully meet the UK and European Resuscitation Council Guidelines 2015 as per the HSE requirements. This course meets the JAUPT requirements for CPC if run through an approved JAUPT centre. ProTrainings Vocational Training Qualifications (VTQ) are fully recognised by the HSE as Trade Body Qualifications. This course must be at least 7 contact hours and run over a minimum of 1 day and the certificate is valid for 3 years. To renew you need to attend another EFAW 7 hour course. Candidates completing our EFAW courses receive access to our video library for refreshing skills and reference. This qualification is accepted in England, Wales, Scotland and Northern Ireland. It is also accepted in many other countries.Students must be a minimum age is 14 years old.